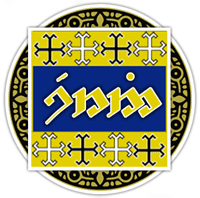 begins by carrying away small stones"
Serni (S. “Shingle, pebble bank”) is the richest and most influential noble family in Lebennin and one of the Herenya (Exalted), families who came from Númenor. In the rolls of Heren Requain they appear as bannermen of Anárion, but no one remembers how they came to dominate the fertile river valley in eastern Lebennin, stretching from the White Mountains to the Gilrain Bay, where they took their princely name. According to ancient inscriptions, founder of the house might have been a man named Kalazôr Ûriyat, who lived during the Last Alliance, which means that their original surname was "sun-and-moon" (Ûriyat in Adûnaic). But that name does not appear in the rolls of Heren Requain, and it is possible that this man is not related to the Great House at all. All we know for certain is that it was not before the 9th century when the family acquired enough land in the Serni Valley to be properly called "Serni", and they might have not had a surname before that. The original sigil of the House was a double-cross. First of his family to be called Lord of Serni was certain Curvegil Dúnedhel, who had made a fortune in the wars of Tarannon Falastur. However, in the records of Heren Requain, his name was written "Curvegil, 13th Lord Serni, also known as Dúnedhel, of brown hair and fair complexion". They prospered during the Ship-Kings by investing in ships and engaging in viticulture. Serni wineyards and their produce became hallmarks in their trade and standards against which every Lebennin wine was tested. The Serni suffered during the age of Castamir for their unwillingness to take part in the Kin-Strife; but after all the leading houses of Lebennin (Lintoron, Miruvor, Alcarialë, Númendur) withdraw to Umbar and their possessions were confiscated by King Eldacar and his supporters, House Serni came on the top, and could present the new King a credible fiction of resistance to the Usurper. After 1450, the Serni became virtual rulers of Lebennin, and uncontested leaders of its Diet. They are known as shrewd politicians, self-satisfied, aloof and fiercely independent men.